Home topics news Even Vogue makes good eco-resolutions for 2019! 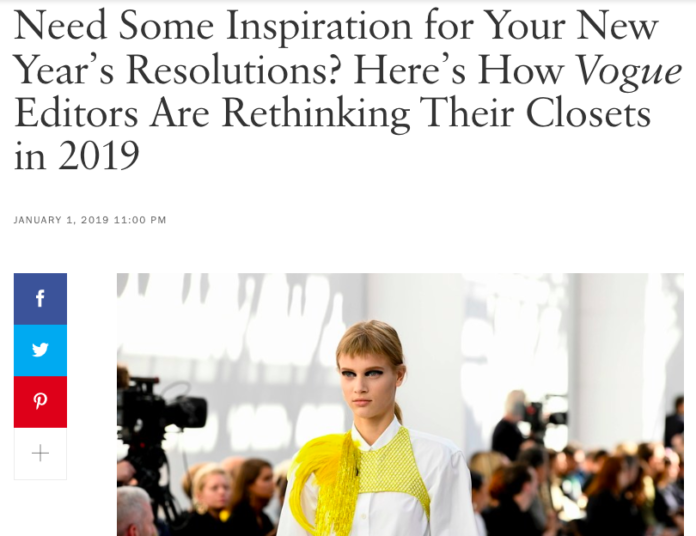 The good resolutions at the beginning of the year are a classic that cannot be refused, if we are then able to succeed is another matter, but here we don’t want to pre-judge the intentions, rather, we applaud them, especially if they are positive and virtuous like those that Vogue workers have ‘subscribed’ for 2019. “Be more sustainable. Wear all the clothes you buy. Give up a sneaker addiction” . The Vogue.com team’s intentions have to do with a more conscious, thoughtful method of shopping and wearing, so it would be nice that the followers of the most famous fashion magazine in the world also follow these trends, before all the others proposed. Sally Singer, Creative Digital Director, hopes for example to wear everything she owns at least once and to discard the rest. As a result, Singer imagines she will wear a lot of “wild dresses in rather tame circumstances, and it will be decision day for a heap of denim” . Ironic. The resolution of Sarah Mower, Chief Critic, is “only to buy small-run, handmade pieces to support independent designers who are thinking about ethical and non-damaging production” . And she cites Fashion Revolution’s motto – ‘Who made my clothes?’ – relating it to a pair of earrings from Matty Bovan, created by his mom, Plum Bova, aka Begonia Peterson, at home. Creative. “I’ve spent a lot of fall mornings staring deep into my closet, looking for satisfying pants/shoes combinations” says Nicole Phelps, Vogue Runway Director. 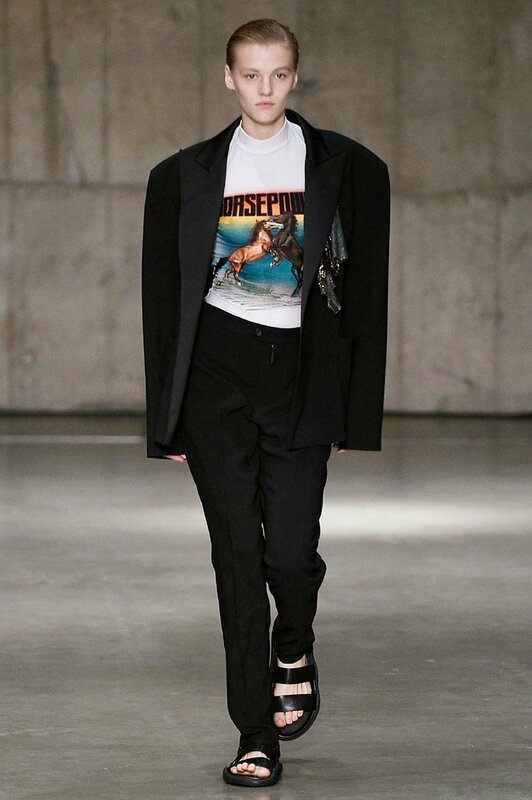 “In 2019, I resolve to find a pants/sandals combo as cool as this one from Christopher Kane and wear the hell out of it. I’m a big proponent of a uniform” . Pragmatic. And then there is Laird Borrelli-Persson, Archive Editor, who talks about a pair of never-been-worn-before vintage boots on eBay that lift his spirits when he pulls them on. And he adds that he “can wear them guilt-free, knowing that he’s using something that already existed in the world – and no one else has” . Sentimental (in a good way). The diktat of Mark Holgate, Fashion News Director, is to wear what he owns without buying anything new. That’s it. “Learn to take pleasure in what’s already mine and not yet more acquisition” . Wise. Luke Leitch, Contributor, proposes to stop buying sneakers: ” I love sneakers. They make me happy. But they have a horrendously short half-life and feel like a wasteful high-hydrocarbon purchase that could easily be substituted for near perpetuity by a good pair of Tricker’s, Church’s—or even DMs” . And so on, among those who want to clean up the wardrobe and who promises to spend less and better. If you want to discover the other propositions of the Vogue.com team, here is the link to the article. Congratulations on the good eco-resolutions of colleagues, pity that we can not go to check their closet to see them really implemented … but that’s okay, as we said at the beginning of the post, the important thing is to try. And believe it. Previous articleFor a more and more eco-sustainable 2019!